Working under the direction of Lauren Rabb, UAMA Curator of Art, James Tissot and The Prodigal Son in Modern Life is the curatorial debut of Lené Carroll, a University of Arizona senior history major with a minor in classics. 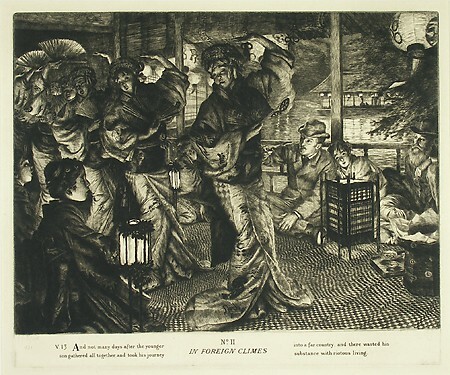 The series of five etchings take the Biblical story of the Prodigal Son retelling the scenes in terms of “modern life,” in this case the late nineteenth century. The Prodigal Son in Modern Life series was completed in 1882, on the cusp of transition in Tissot’s life. He exhibited these works in England and France, and their great success can be attributed not only to the expert execution of the prints but also to a theme generally loved by the public. Tissot’s mistress and muse, Kathleen Newton, can be seen in three of the five plates. She died of consumption shortly after the completion of the series, at the age of only twenty-eight. After her death Tissot shifted away from the depiction of “vulgar society” and began some of his most well known works: paintings from the Old Testament, and the renowned series The Life of Our Lord Jesus Christ (with a total of 350 illustrations).